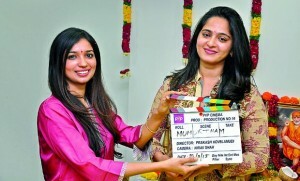 Anushka is doing another female oriented movie and the movie is titled Size Zero. PVP is producing the movie and announced Production number 10 as a bilingual movie in Telugu and Tamil. Size Zero is a romantic comedy and directed by Prakash Kovelamudi, son of K.Raghavendra Rao. This movie is officially launched yesterday. Anushka, Arya, Bharath and Urvasi are the main cast and Shruti Haasan is going to play a cameo. M.M. Keeravani is scoring the music and Kanika Dhillon, wife of Prakash, has penned the story and screenplay for this film. Kanika earlier worked for Hindi movies and Size Zero will be debut in Telugu.